I’ve been hitting the local Farmers Market quite frequently for a few months now. Exploring, learning, and shopping at the Farmers Market has been something that I've wanted to do for a long time, but I guess it took me a few years to really get into the habit. Farmers Market (or local market, as its popularly known here) is a public place where farmers and growers interact directly with buyers and other members of of the community. It's become an important service in most cities, where farmers can make a decent profit by selling retail and buyers have access to fresh locally grown produce. Farmers Markets are critical for the survival of small family-owned farms and preservation of the agriculture oriented island communities across the country. Yes, some items may be slightly pricier than what you'd pay at your local grocery store, but if you think about the quality, flavor and freshness you'll totally agree to spending a bit more. Besides, a lot of stuff is also cheaper and still of higher quality and freshness, especially what is in season. The last time I went there Papaya was in season and being sold at MRF 5/- a Kilo. I bought a few, naturally. By shopping at the Farmers Market I get to buy locally grown fresh fruits, vegetables and stuff while doing my bit to support local commerce and agriculture. Local farmers work pretty hard and I think they need all the help that we can give. My local Farmers Market is situated at the busy marine drive near the old Fish Market area. On my first visit the market looked like a busy, loud and chaotic place with people shouting indiscernible stuff at each other and laughing at their inside jokes. I had no clue what they were saying. I remember I was overwhelmed by the scene, especially seeing buyers who possessed almost a cult-like knowledge of exactly which stall they wanted to go to, what they wanted to buy and where all the bargains are at. I almost felt like a trespasser, it was definitely not a very inviting place. Fortunately for me, it was a just a phase, it soon passed. Now I feel quite confident shopping at Farmers Market. I can never be as good as some people I know or who I see there regularly, but I don't think I will be lost in the crowd anymore either. My local Farmers Market has recently been cleaned up, renovated and reorganized. Its quite family friendly now and I've seen kids enjoy their outing there. If you have never been to your local Farmers Market, I sincerely suggest that you check the place out. You might find some stuff that you have always wanted to try but not normally available at your favorite grocery store. You might even discover something that you like that you've never seen or tried before. Who knows, you may even enjoy shopping there. Same as you, it has been a while since i am also using local market for my daily consumption of groceries. I usually buy papaya, watermelon and banana. 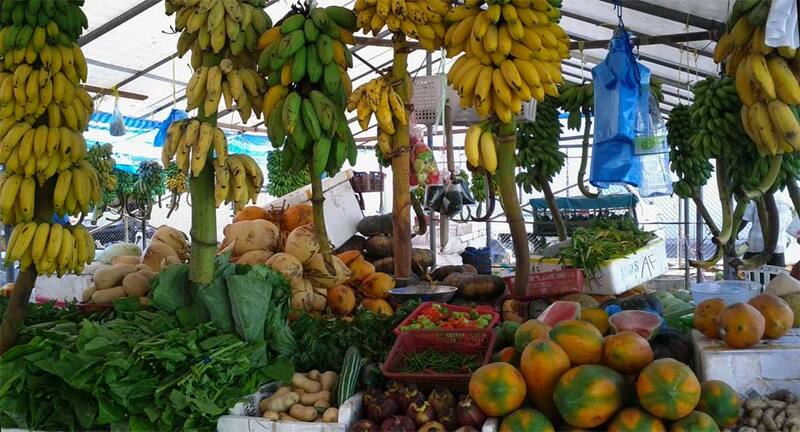 its way cheaper and alot fresher than the grocery stores around Male'. i used to visit the place frequently with a friend; to stuff for his local shop. i would say, you will get better rater at the Local market rather then buying local stuff from a "Kanmathi Fihaara" or a nearby super-mart. i used to visit the local market quiet frequently during the first half of this year. I must say that its very interesting to see all that activity of sellers and buyers. You don't see anything like that in Male'. How are the Farmers Markets in S'pore ... ??? Wanna share some photos ??? The Male local market is not a Farmer's Market. A Farmers Market is one where the actual growers sell directly to customers. The stallowners in the Male local market are not the farmers who actually grow the produce. Farmers from agricultural islands send their produce in boats that come into Male in the mornings. The stallowners then buy the produce in bulk at low prices and sell to the public at a profit. The prices of the produce is set by the stall owners as they see fit. It is not an ideal setting where the farmers and consumers benefit. Prices/availability and thus the advantage lies very much with the stall owners!